History - Waipa Mountain Bike Club Home of the Waipa Mountain Bike Club. Brett Purchase of TeA Cycles called a meeting of people interested in forming a local MTB club in his shop on June 16th 2008. Nine people attended the meeting. They were Brett Purchase, Andy O'Regan, Brendan Haigh, Jeff Tucker, Jan Hania, Tui Allen, Steven Fleming, Scott James and Kevin Hammond. That meeting is pictured below. (Tui Allen on camera) On the right of the photo, wearing a blue hat is Brendon Haigh, a keen and active rider and resident of Pirongia, who took up Brett's challenge and spearheaded the move to develop the new club. He was subsequently elected as its first president. 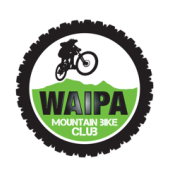 The name "Waipa Mountain Bike Club" was bestowed and the nickname WAMOs quickly followed. Locations for possible tracks for local riders to use were dicussed. These included Kakepuku and Pirongia. The first step was to call an inaugural general meeting, publicise it and hope to attract enough people to launch the club. Contact details and email addresses of those present were collected and formed the beginnings of the email contact list. Tui took over the management of the list and consequently slipped into the job of club secretary and communications officer, agreeing to create a club website when time allowed. It was 6 months before time allowed. June 21st 2008 was the date set for the first ride. It was to be a reconnaisance ride on Mt Kakepuku. The idea was to take photos and write up the story of the ride and the new club and its objectives for publication in the Te Awamutu Courier to help spread the word through the community about the existence and objectives of the new MTB club. Over the next few weeks, various articles and photographs appeared in local papers. Contact details were included on each, so the list of contacts of people interested in the club rapidly grew. The inaugural AGM was held on 7th August 2008 where the club was launched and a committee formed. This first committee included Brendan Haigh, Tui Allen, Scott Miller, Andy O'Regan and Chris Couldrey. Chris became the first treasurer. Blair Prescott had been unable to attend the AGM but joined the committee later. A constitution was presented by Brendan and adopted by the club enabling Brendan to arrange affiliation with MTBNZ and legal incorporation almost immediately the club was formed. Monthly committee meetings were arranged where club rides were planned and then publicised through the contact list and at TeA Cycles. The first few rides included an "Urban Assault" through the secret off-road trails of Te Awamutu, a night ride up the Kaniwhaniwha stream at Te Pahu, rides on Kakepuku, reconnaissance missions to Sainsbury Rd on Pirongia, a very successful expedition to the excellent new trails at Tokoroa, and participation in the "Pukete Spaghetti" organised by neighbouring Hamilton MTB Club. After considering the various options for trail development, the committee decided to focus its efforts on developing a proposal for a MTB track on Waipa District Council land above Pirongia village, at the top of Sainsbury Rd. Our proposal was carefully reviewed by the council. This site would provide a good combination of terrain, public access and scenery. 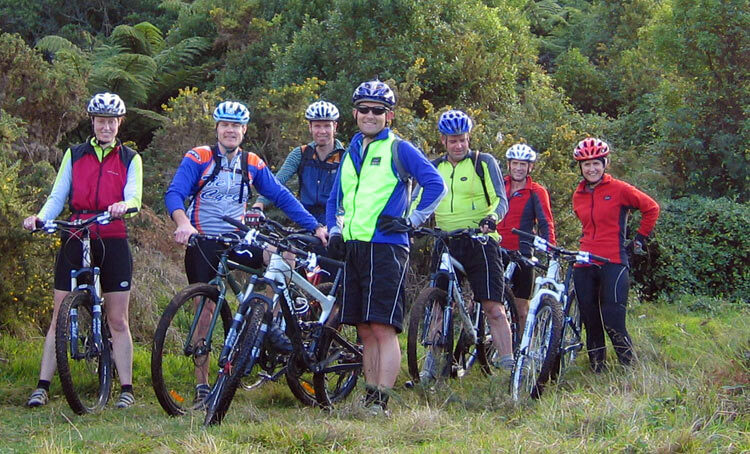 There is considerable support from within the local community, including members of the the Pirongia Tourism Association and the Pirongia Mountain Restoration Society who can see the advantages, both to the mountain itself and to the Pirongia community, of increasing public use and appreciation of the mountain through mountain-biking. The Sainsbury Road area of Pirongia consequently became the main trail-building focus of the fledgeling club. After much work on the part of club president Brendan Haigh, negotiating with council and DOC, a license was finally granted which allowed the club to begin building trails on the Sainsbury road area of Mt Pirongia. The first official working bee was held on 28th March 2010. Ten people and one dog (Opal) turned up to begin the huge task. They arrived at 9am and worked until mid-day, by which time they had created several hundred metres of excellent trail. Those 10 people were: Andy O'Regan, Ralph Kumm, Erik van der Wel, Chris Couldrey, Chris Moody, Jeff Tucker, Scott Miller, Brendan Haigh, Blair Prescott and Tui Allen. 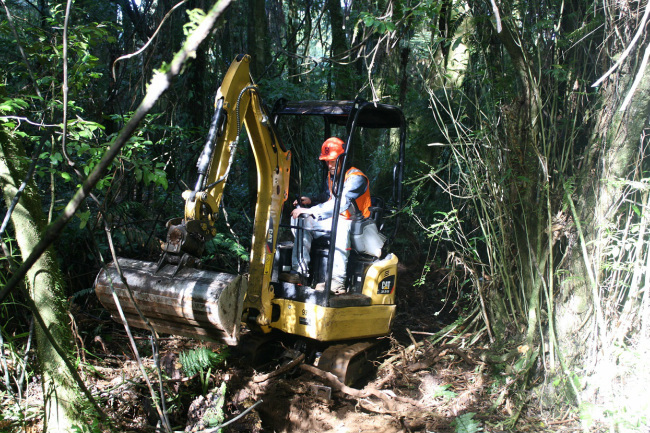 For the next few years, the dedicated Wamo crew continued the task of carving tracks out of the thick bush and by late 2013 well over 2 kilometres of single track has been made. While happy with the track created, the committee agreed that at the current rate it would take too long to achieve the goal of creating a quality mountain bike park on Mt Pirongia. The committee decided to pursue gaming trust funding and to employ professional track builders and in mid-2014 Southstar trails began work, building 2.5 kilometres of top quality single track. Given the overwhelming success of this first project, two more trails followed in late 2014 and early 2105, prompting unprecedented interest in the club and Sainsbury Road. This hard work was rewarded when the club were named runners-up in the 2015 TrustPower Waipa District Community Awards. A great recognition for the hard work that has gone in to create a quality community asset. But it doesn't stop here, the club's plan is to continue applying for funding in order to build more trails. Watch this space!